No less than 50 sets for one order. Packing in individual boxes, then delivered with outer corrugated cartons. Ø Wire speed forwarding capability of all ports make sure of non-blocking message forwarding. Ø Support 802.1x authentication, VLAN, and broadcast storm suppression. Ø Loop detection and Port+ IP+MAC binding. 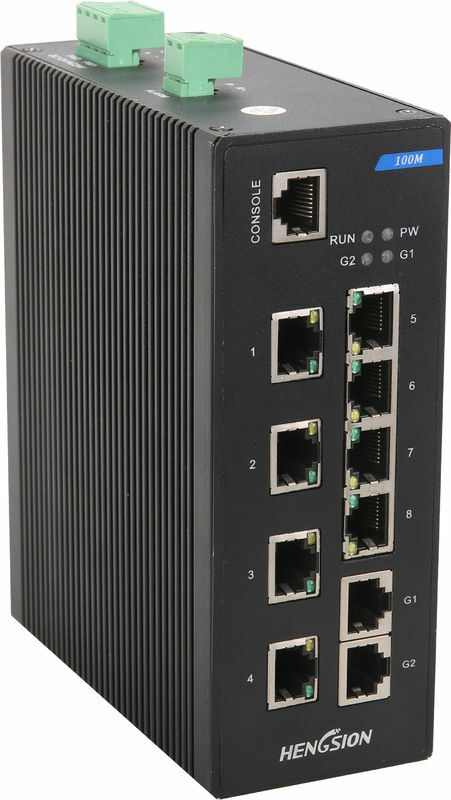 Ø Support POE power configuring, monitoring, diagnosing and summary statistics. Ø Support WEB visual interface, support SNMP management. Ø Support full-loaded operating temperature range -40 to 85℃. Ø No fan, low power consumption design. Ø Din rail corrugated metal casing, meet IP40 protection grade. Din rail corrugated metal casing, meet IP40 protection grade; Dual redundant power input; Comply with CE, FCC and ROHS standards. MIB10 series’ wide operating temperature range and port surge protection design are ideal for application in large flow real-time outdoor environment, and are widely used in industrial automation control and surveillance occasions like campus, community, rail traffic, electric power control and so on. • EM-SFP-GE-A, 1.25Gbps Copper SFP transceiver,10/100/1000Mbps,SGMI interface,100m.